OVERVIEW: Hey Kids, Want Some Chocolates? 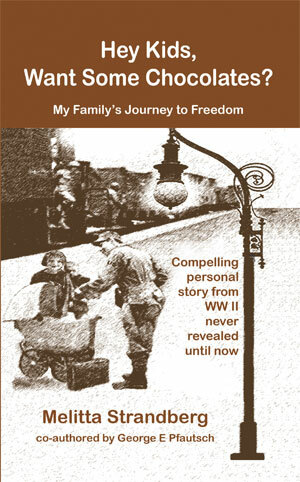 There are few fictional stories that can match the true story of the Mohr family and their long quest for freedom which began in Romania as World War II was getting underway. Their journey from Romania to Weimar Germany would begin a perilous four years in the lives of the parents and their children, especially Melitta. She vanished into a Nazi institution on the day of her birth and would not be seen again by her family for six months. The miraculous circumstances of the reunion with her family would alone make a compelling story. But the dangerous adventures did not end. Their experiences in Weimar, which was also home to the notorious Buchenwald concentration camp, were among the worst that could occur to any family. Later, the family would be confronted with another decision between the time Patton’s Third Army liberated Buchenwald and Weimar and before the region would be turned over to the Soviet Union. Their efforts to catch the last train from Weimar to Augsburg, West Germany, are captivating. ABOUT THE AUTHOR: Melitta Strandberg was born September 3, 1944. The story of her birth and subsequent events are a compelling story. Equally compelling are the quest of her parents to find freedom. They endured much to find a better life for their family. Their story began in Romania and is filled with many risks and many narrow escapes that could have ended their quest prematurely. Melitta’s own quest for freedom ended before she was a year old, but those first few months of her life are intriguing and much about them remains a mystery. Thereafter she has led a successful and typical life. Her first 18 years were spent in Germany and the remainder of her life in the United States. Today she lives with her husband, Herb, in Northern California. ABOUT THE CO-AUTHOR: George E Pfautsch spent most of his working life as a financial executive with Potlatch Corporation, a major forest products and paper company. His final years with them were spent as the Senior Vice-President of Finance and Chief Financial Officer. Following his retirement, he began writing and speaking on the subjects of morality, justice and faith. He has published several books on those topics and he views this book as encompassing each of those subjects. PREVIEW: On September 3rd, 1944, I was born in a hospital in Weimar. My parents were unaware that this particular hospital also served as Hitler’s operation for selecting newborn and young children for experimental purposes. That was especially true for babies born to parents from Poland, Romania, Hungary and Yugoslavia. Once again the foreign nationality of my mother may have played a role. We were not a part of Hitler’s “pure race,” which he intended for Germany. Shortly after my birth, I was taken from my mother and vanished. I was later told that a different baby was given to mom hours later for feeding. My mother refused and told them she was not going to accept this baby because it was not hers. They took that baby away but I was not returned to her. My mother had one recollection of my birth in the few minutes I was with her. She remembered that I had a birthmark on my lower arm. That birthmark would become a significant identification at a later period.